We were hearing this from a polite young man who somehow did not sound quite firm enough. So I kept sitting there in his office as he dealt with other people, the phone, etc. Then I asked, “Are you sure that there is no one you can call?” Five minutes later, we were sitting in the Colonel’s rather fancy office being served coffee and chatting about our extended vacation in Lebanon. Then he told us it was all arranged and that our names would be given to all of the checkpoints. So we were off. Our first stop was Beaufort Castle (Qalat ash-Shakif, in Arabic). 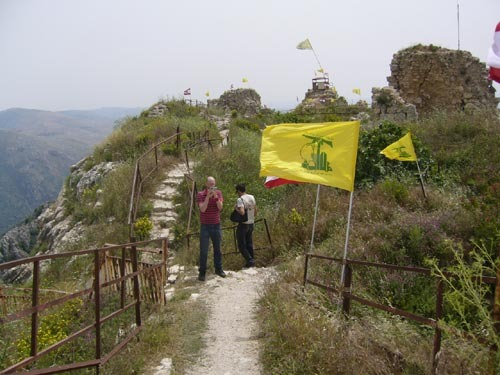 This is one of several crusader castles in Lebanon, and is in very poor shape. 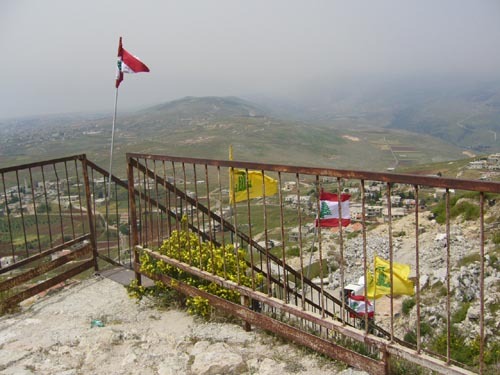 During the Israeli occupation of South Lebanon (1982-2000), the Israelis held it, and now it is under Hezbollah’s control, as is a significant portion of the rest of the south. The views from on top are quite stunning, though it was a cloudy day. 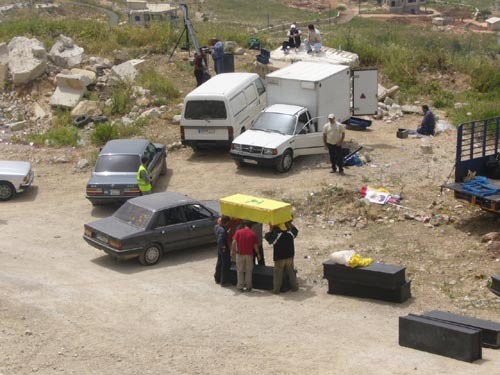 We also watched a film crew prepare to shoot a Hezbollah propaganda video on the ground below. 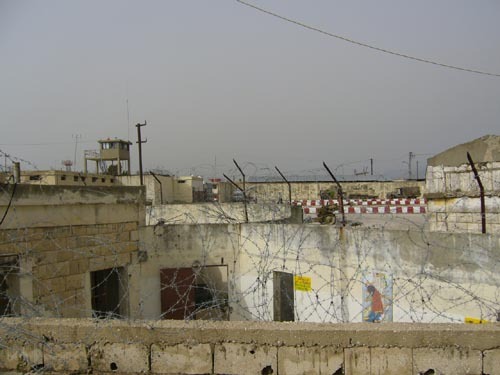 After lunch, we made a stop at Khiam Prison, which was run by the SLA (South Lebanese Army- a proxy army for Israel). A young guy who said he was from Beirut offered to show us around, though he ended up pretty much just reading the signs to us, which are already translated into English. Khiam Prison has been turned into a museum of sorts. You can wander the grounds and read about which rooms were torture rooms, which were for sleeping, etc. A very sad place. 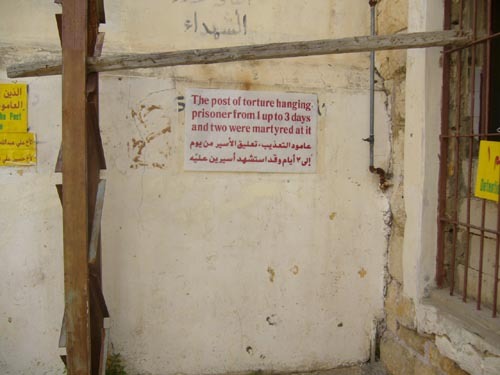 When Israel decided to pull out in May 2000, they just left the prisoners inside. People from the surrounding villages came in to free them. The museum is run by Hezbollah, and there is a gift shop where you can buy Hezbollah, lighters, keychains, DVDs and the like. The man running the gift shop was a former prisoner. A guy who had come to visit began to complain to us about the U.S. labeling Hezbollah a terrorist organization. He was Lebanese-Canadian, so I reminded him that Canada also lists Hezbollah as a terrorist organization, but he was pretty much just interested in complaining about the U.S.
As an aside, it seems that we narrowly missed running into Noam Chomsky again. Could he be following us? After leaving the prison, we decided to drive to the Israel/Palestine border to have a look. 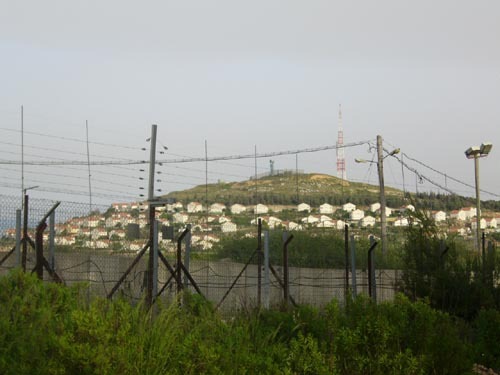 It’s sort of amazing that for 2 countries in a state of war, there is just a fence between them. We stood and looked at an (illegal) Israeli settlement that was surprisingly near. After leaving the border, we promptly got a flat tire. Lots of potholes in these parts, and our tires were probably over-inflated. Malcolm and Ethan put the spare on, and we were off — for another 30 minutes or so, when we got a flat with the spare. Yes, two flat tires. We called the car rental company who came to bring us another car, but had to sit in the dark on the coast highway for an hour while we waited. Thanks for the very interesting article Amy. Just one question. What “illegal” israeli settlement did you see on the other side of the Israeli-Lebanese border? The entire border was confirmed by the UN and one side is the territory of Israel, the other side—where you were—the territory of Lebanon. 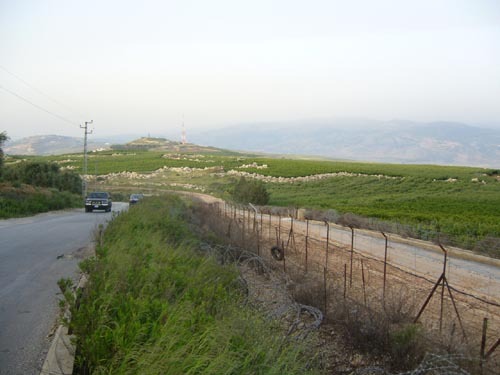 There are the farms that the Hezbollah claims, but the UN and everyone else said that the farms are NOT lebanese. They may be Syria, but not Lebanon. But I see that you refer to the “Israel/Palestine” border….